Ryu Hankil is one of the most interesting musicians from the scene that arose on South Korea recently. Coming from the indie pop and electro music, he concentrated on improvised music after a collaboration with korean noise duo Astronoise and attending a live concert by Otomo Yoshihide, Axel Dörner, Sachiko M and Taku Unami. Hankil uses clockworks as an instrument. He is interested in finding musical structures and so on in the vibration of objects. In this recording released by Taumaturgia, the first solo improvisation by Hankil released, he adds the contact mic and speakers to his previous clockworks and clock parts. The sound is raw, far from the refined and minimalist finish that some exponents of the latest improvisation got us used to; but without being too noisy: Hankil achieves that the sensation that we got is pretty near of perceiving the space where the recording was made as something independent; making us forget external reality immediate to the room where he is playing. 1. various accidents by vibrating speakers with 3 interconnected clockworks. 3. various accidents by vibrating speakers with interconnected mechanical clock parts. 3 clockworks, clock parts, 2 speakers and piezo pick up. Performed and Recorded by Ryu Hankil @ motel Junhibin 2009. Mastered by Hong Chulki. Well it snowed again overnight and on into the morning, bringing much of the county to a standstill again and resulting in a really tough but subsequently shorter day at work for me, so I have had an extra hour or so to listen to music this evening. Lucky me! 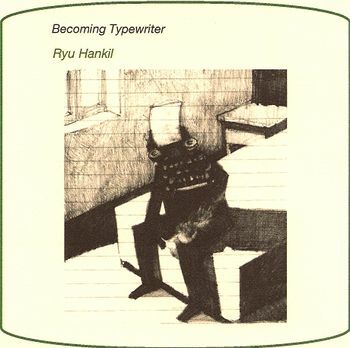 I have finally managed to spend enough time to be able to write properly about Ryu Hankil’s first, wonderfully titled solo release Becoming Typewriter, that came out at the end of last year on the Taumaturgia label, and is available as a free download here as well as being released as a physical CDr. Because it has been out for a while, because it is so easy to obtain, and because I am late writing it up, I suspect that the vast majority of people interested in this recording will have already heard it, and probably enjoyed it, so instead of merely describing it I thought I would mull over some thoughts on the nature of this music and how we receive it. For anyone that does not know the music here it consists of three tracks recorded in a motel room somewhere in 2009. The first and last of these pieces feature Hankil’s now trademark “clockwork parts” which seem to be some kind of motorised rhythmic engines that could well be parts of old clocks. The drilling rhythms of these objects are (I think) captured with the help of contact mics. Alongside this the two pieces also feature “vibrating speakers”, which are responsible for the high pitched sinetone-like sounds we hear. Overall we get tumbling, brittle drilled sounds of different intensities switching on and off, with blasts of speaker feedback and high pitched sinews fed around them. It is really great work, a constantly changing, richly detailed, twisting and turning mesh, with the distant sound of passing traffic audible at quieter moments. Between these two tracks sits a thirty second long patch of complete silence that is named (again quite wonderfully) Ominous motel room. Rather than being a short glimpse of what we can hear faintly in the background of the two more “musical” pieces though, this track is just about completely silent bar the odd tiny click. So the question I find myself asking here is why do I find this music so engaging, captivating, and in places really quite beautiful? When my parents were here before Christmas my father heard me playing this CD and of course made all the disparaging remarks you might expect, questioning how on earth I could call this music etc… To him, as I imagine is the case with most people, Becoming Typewriter is just a load of irritating ugly noise. I think there needs to be some kind of significant difference in a person’s perception of sound to be able to enjoy this music. I wonder if a person could be taught to like it. Could my father, (who probably isn’t the best example to use here), given the time and expert assistance, be trained to appreciate this music some how? My enjoyment in the music comes from the rich uses of texture, the sense of the partly incidental, the surprises built into the sudden changes in sounds, the depth of different approaches to what would seem to many to be actually a narrow area of sound. I don’t find the actual sounds beautiful, and each one separated from the others around it would hold little interest to me, but the way each little noisy phrase shifts into the next one, or contrasts with the previous one, or what lies behind it is often quite beautiful to me. It is inevitable that the comparison is drawn to abstract painting here. To many the way that two lines might intersect amidst a Picasso cubist work is stunningly beautiful, even more so when taken as part of an overall composition. To others someone doesn’t know how to paint a guitar. Why do I find the sudden blast of ugly groaning vibration that appears sixteen minutes into the third track on Becoming Typewriter a joy given the way it suddenly arrives and drops away to leave a gently warbling tone and the sound of the distant streets? Somehow, at some point (I don’t remember exactly when but it was in the early nineties) I discovered the ability to see/hear beyond the purely musical, beyond instruments and consider music purely to be the arrangement of different sounds in some kind of formation, perhaps even an accidental one. I learnt to appreciate how different things fitted together (or didn’t) and how this affected a sense of overall structure. I learnt to forget the unwritten rules about what belongs in music and what doesn’t, and took to listening for relationships between sounds, and also their relationship to the silences (or rather the lack of them) that they sat within. Thinking about it, rather than being a more complex or (ugh) advanced way of listening I think I, and probably most of you reading this now have developed a more simple, elemental way of listening to, and enjoying music. Rather than only find beauty when certain, particular sets of sounds are placed together in a recognised manner we are able to just enjoy things at a very basic level, evaluating the worth of sound a when placed with sound b, irrelevant of what those sounds might actually consist of. What we do differently is probably quite easy to see, but why we do it, or perhaps more interestingly, how we learnt to do it when the next person beside us hasn’t and probably never will is a mystery. My father will never be able to listen to and enjoy Becoming Typewriter. Even when it was just a sound in the background coming from another room it annoyed him a lot. I don’t find the album even remotely difficult listening and deeply enjoy listening to it very closely indeed. Yes I’ve had plenty of practice, but surely there must be something hotwired within me and within you that allows this to happen. Maybe we were all dropped on our heads as babies or something. If so well I’m pleased it happened and I get to enjoy Becoming Typewriter.